Salesforce CRM Training and Certification program in Hyderabad designed by experts to achieve your learning goals on Admin(201) and Developer(401) Modules and real time project based classes by knowledgeable instructors, CRS Info Solutions a leading software classes institute for professional software courses training and tutorials. We provide Online Salesforce training course materials for Salesforce Certification with securing a practice org, database terminology, admin and user interface navigation and custom fields creation, reports & analytics, security, customization, automation and web to lead forms. 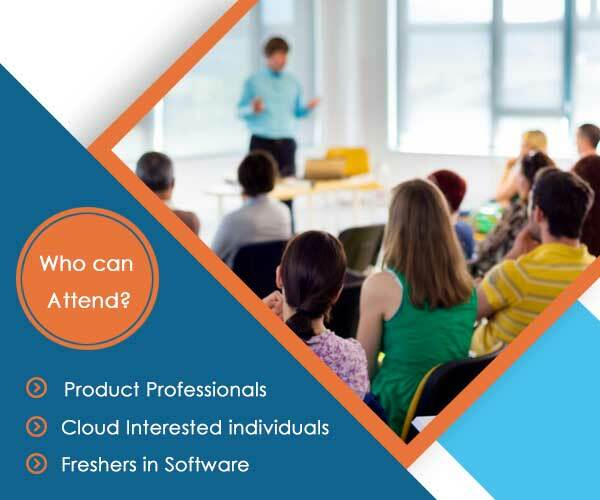 Our Salesforce CRM training institute in Hyderabad provides industry-based interview questions and real time project based training and certification assistance to our participants, enroll to the program to achieve your learning goals. 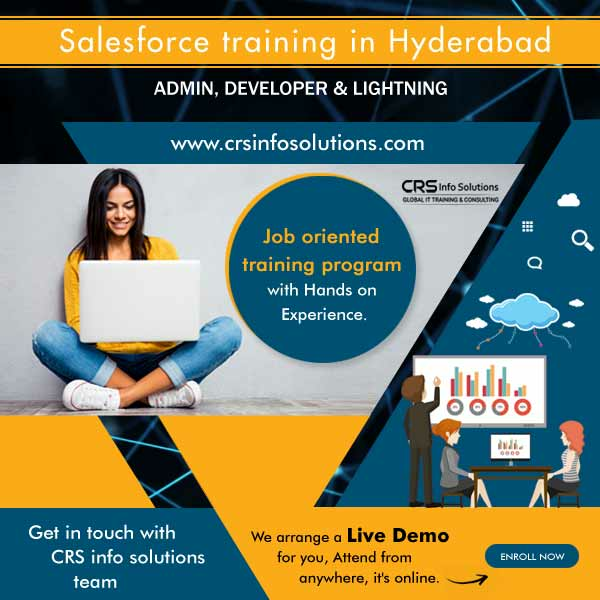 A leading Salesforce training institute which offers salesforce crm admin, developer and lightning learning and certification program in Hyderabad. Get practical and project based salesforce course in Hyderabad with scenario based interview questions and practical knowledge. Become a professional salesforce consultant by learning in-depth concepts that are designed to make you perfect and expert to deal with day to day activities in an organization. Salesforce certification and training in Hyderabad, a course designed by experts and supplies useful material, interview questions and resume preparation assistance that will be helpful to get a better job in CRM industry. Talk to our Learning Consultants in Hyderabad for course details and batch information, Fill the form. Our trainer is Real-time Working professional as a Salesforce Consultant. Trained more than 3860+ participants on Salesforce CRM. Teaching Corporate and Classroom Trainings. Helps in Job Support, Resume Preparation and Interview Questions. Very in depth course material with Real Time Scenarios for each topic with its solutions in Salesforce CRM. Training for Certification is provided during your Salesforce Training. Salesforce Certification Training in Hyderabad will make you an expert in all the concepts related to administration and declarative development options. It will also help you prepare for Salesforce Certification (both SFDC Admin 201 & App Builder Certification). Register today! to get Webinar Invitation. Explore the world of Salesforce CRM and get new job with 50-100% more salary pay and find the best salesforce training institute in Hyderabad. Explore the world of Salesforce CRM and get new job with 50-100% more salary pay and find the best salesforce training institute in Hyderabad. Find the best salesforce training in Hyderabad with professional certification based training in affordable cost. Get salesforce certification admin and developer in CRM domain to become saleforce consultant with better career opportunities. CRS Info Solutions is a leading Computer institute for software courses training and certification programs. 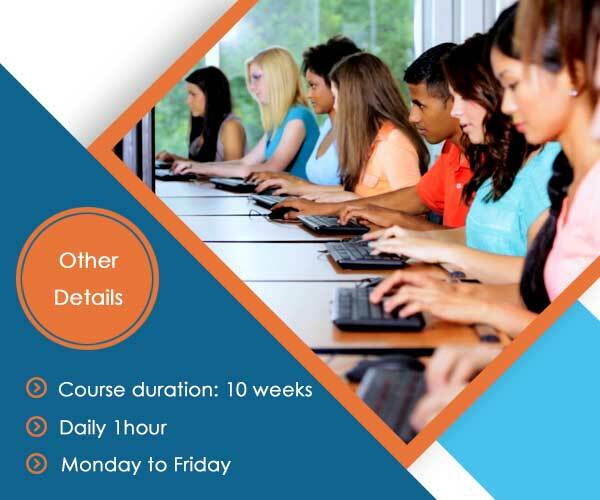 CRS Info Solutions is a pioneer in offering Software training solutions in Hyderabad with a 10+ years of experienced working professional as instructor and included real time projects to get practical skills. Our instructors makes learning fast, affordable and easy with industry based syllabus, scenario based interview questions and hands on learning experience along with useful material supply for free. For many years, our CRS Info Solutions Trainers have helped participants, consultants, professionals, graduated aspirants, enthusiasts and software project managers – you may be from any background, we will improve your skillset and help you in certification programs. Enroll for CRS Info Solutions practical and professional training programs by industry expert tutors and achieve your learning goals with our proven syllabus with real time projects and helpful interview questions. 4.9 out of 5 based on 12685 ratings.